Using dynamic teach-while-doing method children learn how to use FreeCAD’s Draft workbench to model a key tag, a name tag, and a luggage tag. The book introduces students to the concepts of: the Cartesian coordinate system that describes three-dimensional space, conversion of inches to millimeters, the Draft workbench toolbars, draw 2D drafted objects that can be turned into 3D solid objects, how to locate the font file names, how to turn text into 3D extrusions, the concept of orphan parts and how to fix them, how to add non-English character support, exporting of .STL files, using Netfabb Basic to check .STL files for errors, and 3D printer settings. 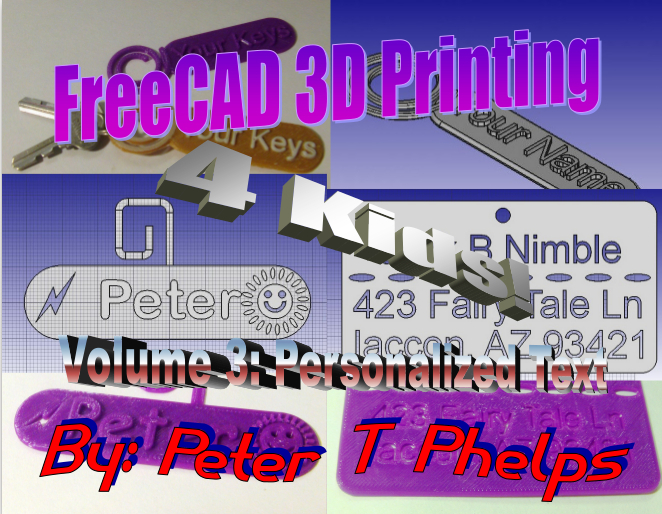 FreeCAD’s ability to be downloaded and ran without connection to the Internet allows it to be a terrific resource for any STEM education project worldwide.